The "Made is USSR/URRS" stamp one of the most definitive of all the possible Spanish Civil War markings that can be found on Mosin Nagants. It consists solely of the text “Made in USSR” or “Made in URRS” stamped into the metal of the rifle. The marking itself can be seen on the receiver portion of the rifle as well as on the side of the barrel shank. In other cases the mark can also be found on the rear sight base, though this is more uncommon. It is important to note that sometimes the mark will not have been struck very strongly and will be difficult to see. It’s not uncommon to only see only part of the mark if this is the case. 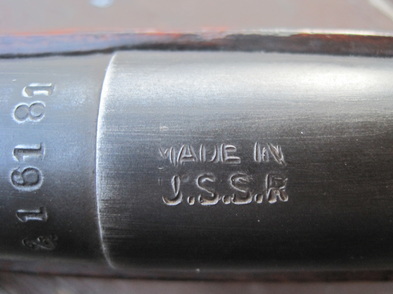 When this mark is found on a Mosin Nagant there is no doubt to the history of its origin. So what exactly is the history of this particular mark? The mark itself is actually what would be considered an import stamping. Even before the enactment of much stricter importation laws in the post 1968 era, it was still protocol for import companies to stamp the country of origin upon the rifle. However, it is not at all uncommon to find a Spanish Civil War Mosin Nagant lacking this mark. Many of these rifles simply missed the mark when they were brought into the United States. Prior to the enacting of the 1968 Gun Control Act importation of guns was not nearly as closely managed as today. 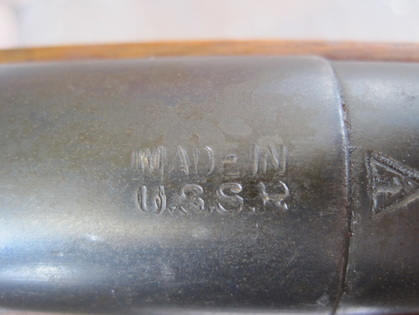 Many collectors may see this marking and be led to believe the rifle is actually directly from the Soviet Union, since it does state “Made in USSR”. However the mark is meant to say only who MANUFACTURED the rifle, not where it was imported from. So it is completely legitimate to see this marking on Spanish Civil War rifles. In fact it is possible to find other rifles imported from Spain and other countires during this period that have similar marks indicating production in different countries (Exp: “Made in France”, ect). Another interested aspect of this mark is the variation which says “Made in URRS” instead of “Made in USSR”. What is the meaning of this marking? The truth is there is no 100% consensus regarding this mark. The most common belief is the most obvious: a simple mistake. This theory is very logical since it is not uncommon to find similar mistakes on the import marks of other military surplus rifles (Exp: Listing of the wrong country, wrong rifle type, wrong caliber, ect). The 1968 GCA was mainly the result of the assassination of President John F Kennedy. There was a great deal of difficulty in tracking who purchased the rifle used to shoot Kennedy, mainly because serial number and importer marks were not required.